All 12 KAYAK coupons have been verified and tested today! Interested in booking your next vacation for less? KAYAK is the perfect place to start. Using KAYAK, you can browse hotels, cruises, rental cars, flights, travel experiences and more, and get the lowest rate on each booking, thanks to smart travel algorithms. For deals like these and many more, book your flight, hotel and more with KAYAK, and stretch your dollar further. Not sure where you want to go, but sure that you don’t want to overpay for flights, hotels and more? You can always browse the latest deals at KAYAK. Just head to the homepage, and click “Deals” to view all of the latest discounts, special offers and more. Then, book right away to get your savings. One of the best ways to save with KAYAK is with a travel package. By booking flights and hotels, you can get some serious savings, and simplify the booking process. To get started, just click “Flight+Hotel” on the main KAYAK homepage. Then, you can see all of the travel packages available, or search for your destination. This price tracker uses AI to let you know if a flight is likely to increase in price, decrease in price, or remain the same price in the next 7 days. Follow its tips, and you’re sure to save. Fee Assistant is located right below the KAYAK price tracker, and allows you to see how much you’ll pay in baggage fees with a flight. You can choose how many Carry-On and Checked bags you’ll be bringing, and then your price will be updated, based on the fees from each airline. This helps you get a great idea of how much you’ll really pay for your flight. KAYAK will recommend the “best flights” to you first, but these are not always the cheapest. Instead, these flights balance low fares with other amenities and benefits, such as a direct flight, short layover, and other such things. If you scroll further down the list, you can probably find a better flight, but your trip might be a bit more uncomfortable, or it may take longer to get to your destination. Looking to book flights, cars, accommodations and travel on the go? You’ll definitely want to download the KAYAK app, which is available for both iOS and Android devices. 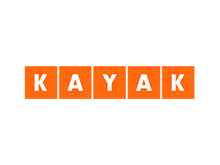 The KAYAK app has exclusive savings, and it’s easy to use, so download it from the App Store or Google Play Store now, and get more for your money from KAYAK. Then, just enter your email, and confirm your account by creating a password. Next, provide KAYAK with some personal information, like your name and home airport, and you’ll be all signed up. You’ll be able to set your own account preferences, book travel, and get all of the latest KAYAK coupon codes and other offers sent straight to your inbox. Sign up now, and you’ll be able book your next trip for less. Even if you don’t have a KAYAK promo code, you can save big with the KAYAK Price Tracker. This tool lets you keep an eye on fares for specific flights and the cost for hotel bookings, allowing you to reserve a spot for less on your next trip. To use the Price Tracker, just head to KAYAK now, and start browsing reservations. Then, in the upper-left corner of the screen, you’ll see a little box that says “Our Advice,” and a toggle switch that says “Track Prices.” Click the switch, and sign into your KAYAK account, and you’ll start tracking the price. Then, you’ll get regular updates to your email inbox whenever the price falls or increases, allowing you to book at the lowest possible rate. If you’ve found a special deal or KAYAK coupon, but you’re not sure where you want to travel, the company has you covered. You can browse its travel guides online for free, and learn about the best destinations both in America, and worldwide. You can also browse the top 10 destinations that most KAYAK customers visit, allowing you to get a sneak peek of what your travel destination may be like. Start browsing now, and you’re sure to get what you need to book a great trip.